Current issues of interest (presidential search; budget; campaign). To appear in top right column tab labeled “Trending Topics”. 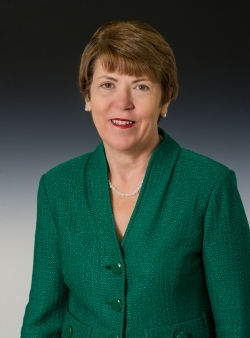 Chancellor Timothy P. White announced today the appointment of Susan Martin as the interim president of San Jose State University. Martin, the former president of Eastern Michigan University, is a seasoned higher education leader with extensive experience in managing large, diverse universities. She will assume leadership of the campus on August 18. Martin replaces President Mohammad Qayoumi who is leaving to serve as the chief advisor for infrastructure and technology to Afghanistan President Ashraf Ghani. 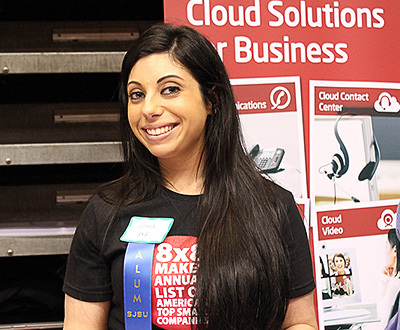 2013 SJSU career fair (photo by Christina Olivas). Silicon Valley companies hire more San Jose State University students and alumni than any other college or university in the country, according to a recent analysis. “Jobvite, a recruiting platform, analyzed seven million applications and 40,000 hires to determine the schools that had the most students hired by top companies in and around Silicon Valley,” according to Business Insider. San Jose State came out on top. More than 75,000 career opportunities including 11,000 internships were offered last year through the SJSU Career Center. 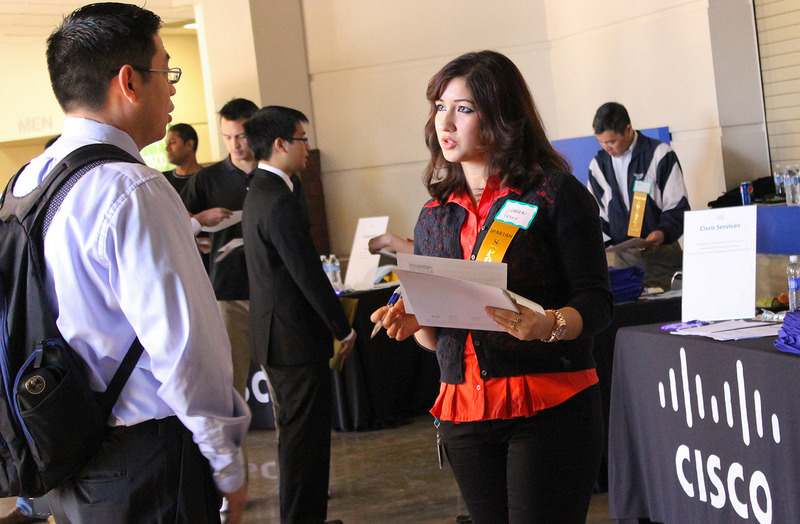 Approximately 4,000 employer representatives attended SJSU career fairs last year. Engineering and business were the top two industries recruiting on campus, followed by the non-profit/government, education and communications sectors. Pat Harris, SJSU Media Relations Director, 408-924-1748, pat.harris@sjsu.edu. SAN JOSE, CA – San Jose State University President Mohammad Qayoumi will leave the university next month to assume an advisory role to Afghanistan President Ashraf Ghani. His last working day at SJSU will be Aug. 17. In a letter to the university community, Qayoumi, a native of Afghanistan, explained his decision. “Since 2002, I have often been asked to lend my intellectual and operational expertise to many of Afghanistan’s significant economic, educational and infrastructure challenges. President Ashraf Ghani has asked for my immediate assistance and leadership in numerous infrastructure initiatives,” Qayoumi wrote. 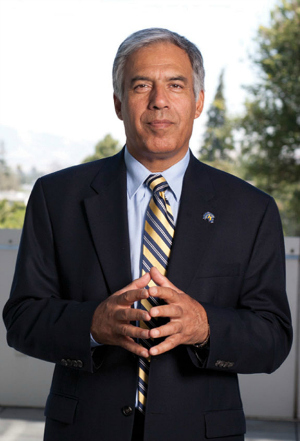 Qayoumi was appointed SJSU president in March 2011 after serving in a similar role for five years at CSU East Bay. He has held numerous CSU leadership roles for more than two decades, actively contributed to U.S. cybersecurity policy and periodically advised various Afghan leaders, including its finance minister. In a statement, CSU Chancellor Timothy P. White praised Qayoumi’s commitment to STEM education, a key element of SJSU’s influence and impact in Silicon Valley. “Mo is leaving the campus with a solid fiscal foundation and proud legacy of achievements. His laser focus on innovation, coupled with his tireless work in expanding the visibility of the campus within the technology sector, have advanced the campus’s stronghold in the region as a leading provider of STEM (science, technology, engineering and math) graduates,” White said. Qayoumi expressed gratitude for the opportunity to serve SJSU. 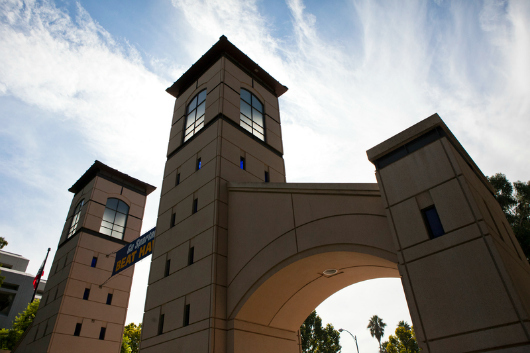 The founding campus of the 23-campus California State University system, San Jose State provides a comprehensive university education, granting bachelor’s and master’s degrees in 134 areas of study with 110 concentrations – offered through its eight colleges. With more than 30,000 students and nearly 4,370 employees, San Jose State continues to be an essential partner in the economic, cultural and social development of Silicon Valley and the state, annually contributing more than 7,000 graduates to the workforce. Posted by the San Francisco Chronicle on June 26, 2015. Malala Yousafzai, the world’s youngest Nobel Peace Prize laureate, told hundreds of people in San Jose on Friday that “education is every child’s right” and urged support for widespread efforts to guarantee secondary schooling for children around the world. Posted by the San Jose Mercury News on June 24, 2016. San Jose State University will be in the spotlight at this year’s Rose, White & Blue Parade, which will wind its way through San Jose’s Shasta Hanchett neighborhood on July 4. When I first heard about the theme, I wondered who would be grand marshal. President Mo Qayoumi? Maybe one of the university’s many distinguished alumni? The answer floored me, and in a good way: Krazy George. The inventor of “the Wave” and the best drum-banging cheerleader the Spartans ever had, will be one of the guys leading the parade and trying for the world’s longest “wave.”Read the full story. President Barack Obama meets with the 2013 winners of the Presidential Award for Excellence in Science, Mathematics, and Engineering Mentoring in the Oval Office, June 17, 2015. Professor Soto is on the far right (Official White House Photo by Pete Souza). 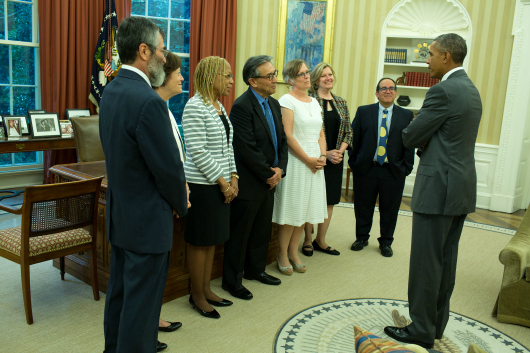 Professor of Biological Sciences Julio Soto met President Barack Obama at a White House reception on June 16 recognizing recipients of the Presidential Award for Excellence in Science, Mathematics, and Engineering Mentoring. The award honors individuals who have made extraordinary efforts to engage students from communities that are underrepresented in science, technology, engineering, and math (STEM) fields. The National Science Foundation organized the event. Soto served as the principal investigator on two groundbreaking grants at San Jose State. Under HHMI-SCRIBE, Soto and colleagues transformed the core curriculum for biology majors. With NSF-RUMBA, Soto coordinates summer research opportunities for under-represented students. Together, the programs equip students with the academic and applied opportunities they need to excel in graduate school and beyond, reflecting the department’s emphasis on hands-on, inquiry-based learning activities at the bench and in the field. 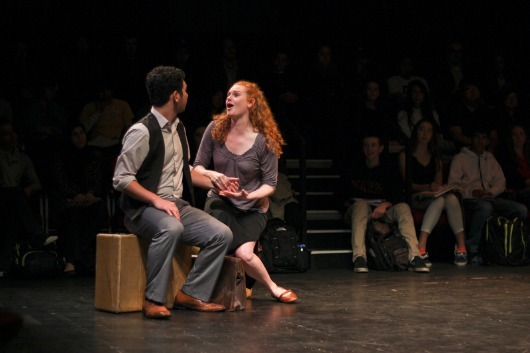 SJSU programming, co-productions and a rental program are among the parameters for operating Hammer Theatre (photo by Christina Olivas). San Jose City Council has unanimously approved a recommendation that the city manager negotiate and execute an agreement with San Jose State University for operations and maintenance of the Hammer Theatre for three years. This is the latest step in a nine-month process that has included input from the campus community, discussions with the Hammer Theatre Advisory Committee, and several public presentations, including today’s. I am excited about the potential of a city/university partnership to provide new, engaging learning opportunities for our students in a variety of disciplines and contribute to vitalizing San Jose’s downtown corridor,” President Mo Qayoumi said. While it is premature to predict when the theatre will reopen, the intent is to have it ready for use as soon as possible. This will be based on time needed for renovations and related operational issues. 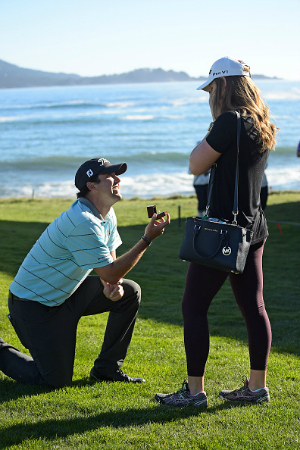 Congratulations to three SJSU alumni! The Walt Disney film they worked on, “Big Hero 6,” won an Oscar for best animated film at this year’s Academy Awards. “Big Hero 6” is a 3-D animated comedy about a plus-size inflatable robot and a prodigy who team up with a group of friends to form a band of high-tech heroes. Scott Watanabe was the lead art director. His wife, Kendelle Hoyer, worked as a story artist on the film, and Lauren Brown, ’13 Animation/Illustration, is a publicist. This is the second win for Hoyer, who also worked as one of the main story board artists on “Paperman,” which won an Oscar for the Academy Award’s Best Animated Short in 2013. Watanabe and Hoyer met in the SJSU Animation/Illustration Program and graduated as art majors in 2006. The student Animation/Illustration club, ShrunkenHeadMan, is celebrating its 20th anniversary this year. The club started in room ART 218. “Our alumni try to sneak either ‘SHM’ or ‘218’ into the films, games and shows they produce. You can catch a ‘218’ on one of the buildings in the credits of ‘Big Hero 6,’” said Associate Professor of Animation/Illustration David Chai. 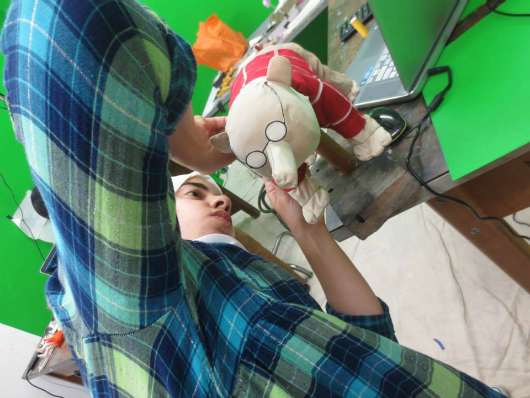 A crew member works on a puppet for the animated short “Behind My Behind” (courtesy of Animation/Illustration). San Jose State University will have a big showing at the 25th Cinequest Film Festival, which runs Feb. 24 to March 8 right here in downtown San Jose. The films are spectacular yet admission is affordable at $6 for students and $8-11 for everyone else. Associate Professor of Animation/Illustration David Chai and 43 current and former students spent three months on “Behind My Behind,” the story of a disheartened writer who reunites with his love for creativity in a secret world he finds in his couch. 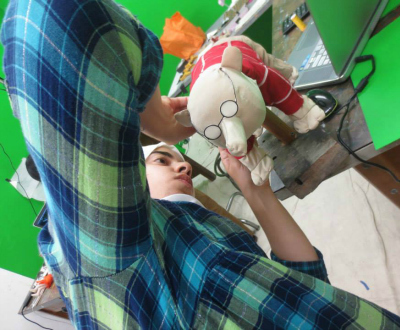 “Fueled by Trader Joe’s bananas and Costco pizza, students worked on everything from animation, creating backgrounds and building puppets and sets to looking for props at flea markets,” Professor Chai said. 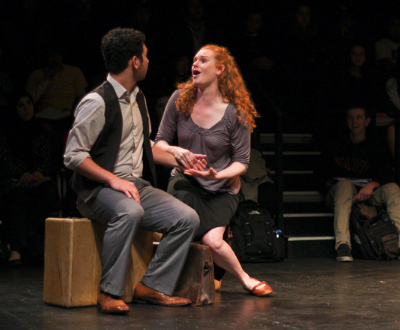 A scene from “Behind My Behind” (courtesy of Associate Professor David Chai). 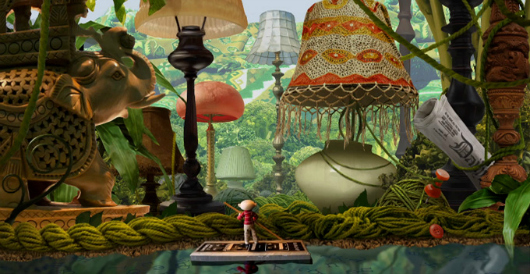 This is Chai’s 11th film, and the first one featuring stop-motion production. The short has already won two awards and been accepted into six film festivals total. “Animation is a ton of work,” said Professor Chai, but he and his crew added some fun. “We had many themed days including plaid and glasses day [dressing like the main character in the film], amazing hat day, chips day, necktie day, superhero shirt day, and a disastrous uncooked rice day,” Professor Chai said. Joshua Pausanos, ’15 Radio-Television-Film, and three friends had a few laughs while working on their new film, “Bell Jar.” JP Emodi, ’15 RTVF, Riley Leggin, ’17 RTVF, and Nika Burnett, a UC Santa Barbara alumna, shot the film over three days. Pausanos and Burnett wrote “Bell Jar,” inspired by Sylvia Plath’s novel, The Bell Jar. Meticulous preparations for a swim in a scene from “Bell Jar” (courtesy of Joshua Pausanos, ’15 Radio-Television-Film). “We wanted to tell a very visual story showing the pressure and failure involved in wanting to be perfect at something. We chose to do this by following a swimmer who strives to be perfect,” Pausanos said. “Bell Jar” won the award for best cinematography at the SJSU Campus MovieFest last October and will compete in the same category at the Campus MovieFest finale this summer in Hollywood. Jacob Ohlausen, ’15 RTVF, and a crew of 20 current or former SJSU students produced “9th Hole,” a comical look at fathers protecting their daughters on prom night. The film was created for Cinequest’s Barco Escape program, which uses technology to give movie goers a more immersive cinematic experience. Instead of one screen, the Barco Escape uses three screens of images and sound, placing the viewer right in the middle of the action. What’s in a barbershop? 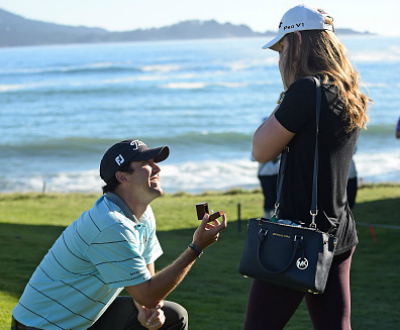 One heck of a story. At a shop just blocks from campus, meet the owner, an engineering college dropout seeking salvation after serving time; his old college buddy, now a Hollywood star; a lesbian barber juggling a domestic relationship and her mother’s stage-four breast cancer; a Muslim struggling to find a quiet place to pray between cuts; an Ethiopian immigrant spending his jobless benefits on barber school; and many more people who have found a home at the Barbers Inc. Associate Professor of Journalism and Mass Communications Michael Cheers and his students premiere their documentary “The Barbershop Diaries” 3 p.m. Feb. 8 at Morris Dailey Auditorium. They’ll also unveil an online portrait gallery saluting South Bay barbers and beauty salon owners. Climate change hit home in 2014, when California shattered hot weather records, according to the Department of Meteorology and Climate Science (David Schmitz photo). California shattered its all-time annual temperature record in 2014 with record highs throughout the state. Data from San Jose State University’s Department of Meteorology and Climate Science shows the annual average temperature in the state spiked unexpectedly in 2014. The average temperature in the Golden State in 2014 was 63 degrees Fahrenheit. That is 4 degrees above normal and more than 2 degrees hotter than the previous high set during the Dust Bowl era – 1934. While many of us were worrying about the drought, we were quietly crushing previous temperature records for our state,” said Alison Bridger, chair of the Department of Meteorology and Climate Science. Professor Bridger attributes the record heat to climate change, driven by increasing amounts of greenhouse gases. Last week, both NOAA and NASA announced that 2014 was the warmest year on record when averaged for the entire globe. “The record California heat brings the reality of climate change closer to home for all of us in the state,” she said. “Warmer temperatures directly affect our agriculture, not to mention precious water resources,” Professor Cordero said. Both Bridger and Cordero emphasized that the global warmth of 2014 is particularly remarkable since it was a non-El Nino year. Oceans store heat, which is pumped into the atmosphere during an El Nino event. When the next big El Nino develops, scientists around the world expect the atmosphere to heat up even more. The data comes from the Congressional Temperature Trends report compiled by Professor Cordero, University of Maryland Associate Research Scientist, Clark Weaver and colleagues. The report uses annual temperature records from NOAA’s National Climate Data Center. 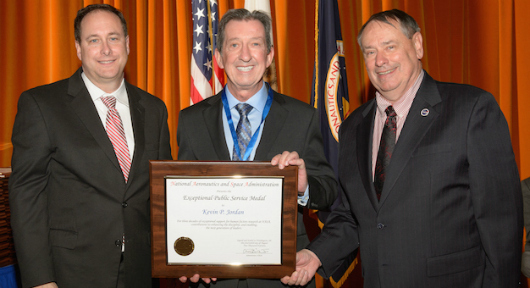 Professor Kevin Jordan at a NASA event with Associate Administrator of NASA Robert Lightfoot and NASA Ames Director Pete Worden (photo courtesy of the Department of Psychology). An SJSU professor who conducts research with graduate students and NASA scientists to make air travel safer has received a $20,000 Wang Family Excellence Award. Professor of Psychology Kevin Jordan will be honored Jan. 27 by the CSU Board of Trustees in Long Beach. Jordan has been a faculty member for more than 30 years, and has served as a committee chair for more than 80 completed master’s theses. A student team is a finalist in Walt Disney Imagineering’s 24th Imaginations competition, culminating Jan. 31. Zaid Karajeh, ’16 Aerospace Engineering, Dondel Briones, ’16 Aerospace Engineering, Amanda Sharpe, ’15 Animation and Illustration, and Simone Getty, ’16 Mechanical Engineering, each received a five-day, all expenses paid trip to the company’s headquarters in Glendale, where they will present their entry and interview for internships. 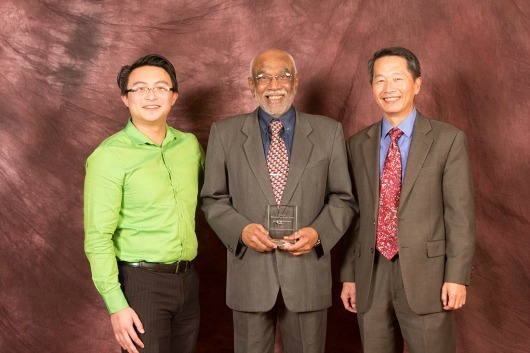 Professor Guna Selvaduray with Daniel Khuc, ’15 Biomedical Engineering, and College of Engineering Dean Andrew Hsu (photo by Kyle Chesser). 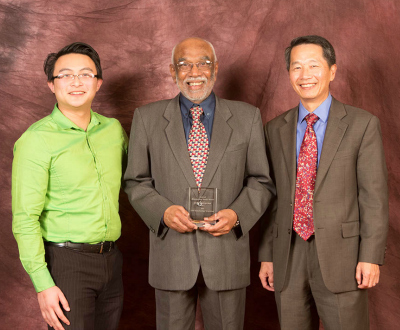 Professor of Biomedical Engineering Guna Selvaduray received the 2015 Andreoli Faculty Service Award at the CSU Annual Biotechnology Symposium held Jan. 8-10 here in Silicon Valley. One CSU faculty member is selected annually for the honor, which recognizes outstanding contributions to biotech programs. Selvaduray led the development of new bioengineering programs at SJSU and the establishment of the Biomedical Engineering Society. Everyone knows SJSU has sports champions. But do you know about our e-sports champion? Sophomore Loc Tran is a top player on SJSU’s video game team, according to The New York Times. “Video game competitions…have taken off on campuses across the country,” the paper said. “More than 10,000 students now play in the biggest college league.” Tran helped SJSU beat CSU Fullerton at a tournament last fall. 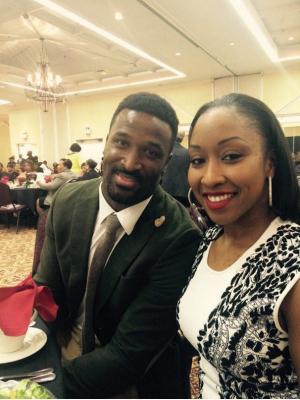 Oakland Raiders wide receiver James Jones, ’06 Sociology, and his wife Tamika Jones, ’05 Child and Adolescent Development, received the Drum Major Award at the 35th Annual Dr. Martin Luther King Jr. Luncheon on presented Jan. 19 by the African American Community Service Agency. The couple founded the Love Jones 4 Kids Foundation, building on James’s start as a homeless child. Also honored at the luncheon with the Facing the Challenge Award was Congressman Mike Honda, ’68 Biological Sciences and Spanish, ’74 MA Education. President Mohammad Qayoumi emailed the following message on the Division of University Advancement to all faculty, staff and students. Vice President for University Advancement Rebecca Dukes earlier today announced her resignation to the advancement division staff. Today is her final day on campus, and we wish her well. While at San Jose State, her achievements included completing SJSU’s first comprehensive fundraising campaign and beginning planning for the next campaign; launching an integrated university brand platform; and initiating programs to deepen a culture of philanthropy on campus. I hope to soon provide an update on plans for interim division leadership. President Mohammad Qayoumi emailed the following message on the Tower Foundation to all faculty, staff and students. As I shared in Monday’s campus update, we recently received and have been reviewing the results of an external investigation into remarks made by a Tower Foundation board member during a February meeting on campus with several university employees including a member of my cabinet. Official notice of the outcome of the external investigation has been sent to the board member and complainant. Per CSU and SJSU protocol and in an effort to preserve the privacy rights of the parties, the university is limiting distribution of this information to these individuals. Wanda Ginner, an alumna of the Lucas College and Graduate School of Business and Tower Board member since 2007, has resigned from the board. Although many efforts are already underway, a great deal of work lies ahead as we seek to be the welcoming, inclusive community all Spartans aspire to. I will share some additional thoughts very soon. Thank you for your patience as we work through these challenging and important issues. President Mohammad Qayoumi emailed the following message on today’s student protest to all faculty, staff and students. Ensuring a tolerant, inclusive and welcoming environment for every SJSU community member is a campus and personal priority. A group of concerned students has announced its intent to gather today to discuss an incident of concern that occurred earlier this year. Although confidentiality considerations limit what can be shared today, I want to do my best to clarify what has been and is being done to address this situation. The incident itself involves remarks by a member of the Tower Foundation Board during a meeting in February with a small group of SJSU staff members, including a member of my Cabinet. These alleged remarks were the subject of some follow up discussion, and informal remedies were discussed at various levels. In August, a formal complaint was lodged with our Human Resources office and a formal external review has been ongoing since then. A report based on that review was provided to my office just days ago, and we are now closely reviewing it to determine appropriate next steps. We are especially sensitive to issues of tolerance and civility in the wake of the racially motivated actions against a student in our residence halls in 2013. Although I know some have been frustrated by a perceived lack of action since this incident occurred, we owe it to everyone to thoughtfully, thoroughly and factually determine what occurred before taking action. Posted Nov. 7, 2014 by the San Jose Mercury News. Even at age 94, legendary San Jose State judo coach Yosh Uchida retains a quiet dignity that demands respect. Uchida was speaking Friday on campus at the rededication of Yosh Uchida Hall, the refurbished athletics building named in his honor, when a stream of skateboarders rolled by the ceremony. The last two in the line stopped, dismounted their boards and walked quietly by, as though they could feel the eyes of the old judo master on them from behind his oversize sunglasses. No wonder this guy can still prepare college kids to stand on the Olympic stage. 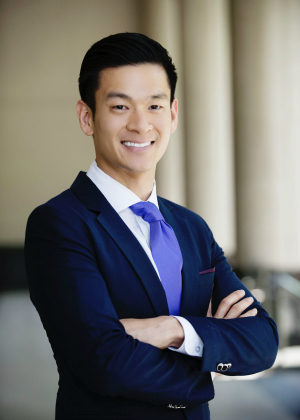 Evan Low, ’03 Political Science, was elected to the California State Assembly, District 28 (photo courtesy of Evan Low for State Assembly). San Jose, CA – Nearly a dozen Spartans are poised to make an impact on their communities after winning local elections on Nov. 4. Most Spartans who run for office studied political science or public administration. Some majored in other fields. For example, Congressman Mike Honda graduated with a bachelor’s in Biological Sciences and Spanish in 1968 and a master’s in Education in 1974. 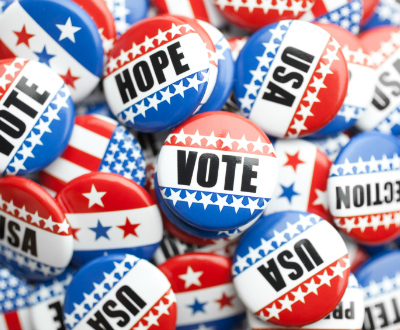 However, just about all SJSU alumni who run for office share experiences and traits that will shape their political careers and the communities they serve. Our students and alumni reflect the diversity of California, with many coming from immigrant and working class families, and representing the first generation to attend and graduate for college,” said Associate Professor and Vice Chair of Political Science Melinda Jackson. “Issues like immigration reform, public education funding, minimum wage increases and other efforts to address income inequality are not just academic for our students. They have a very real passion for these policy issues that comes from their own life experience. All of these alumni are building upon a long legacy of Spartans serving the South Bay and beyond, including Ben Nighthorse Campbell, ’57 Physical Education/Fine Arts, the first Native American to serve in the U.S. Senate, and Gaylord Nelson, ’39 Political Science, Earth Day founder, U.S. senator and Wisconsin governor from 1959 to 1981. These alumni were elected or re-elected Nov. 4. Know of more? Drop us a line by commenting below this story. 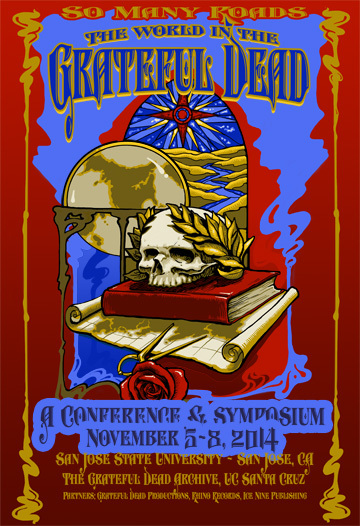 SAN JOSE, CA – “So Many Roads: The World in the Grateful Dead,” an academic conference showcasing the wide-ranging scholarship devoted to the band and its impact on culture and history, will be held Nov. 5-8 at the San Jose State University Student Union. Reduced-fee registration is available through October 6, and a block of hotel rooms has been reserved at the nearby Fairmont San Jose hotel. Sponsors include SJSU in partnership with the Grateful Dead Archive at the University of California at Santa Cruz, Rhino Entertainment, Grateful Dead Productions, and Ice Nine Publishing. San Jose holds a special place in the band’s history. As the band approaches its 50th anniversary in 2015, the issues and events surrounding the Grateful Dead remain compelling to scholars working in a wide range of disciplines. 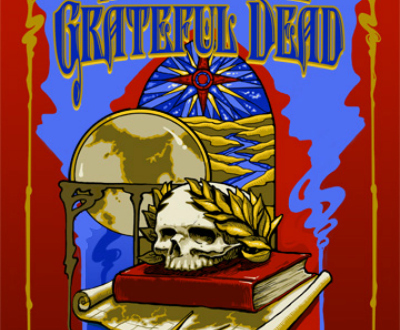 The SJSU event will build on the success and ripple effects of “Unbroken Chain: The Grateful Dead in Music, Culture, and Memory” held in 2007 at the University of Massachusetts. Over 50 speakers are confirmed. The international roster includes academics, family members and associates of the band, journalists, artists, musicians, and over 15 authors of Dead-related books. On Friday, a celebration of San Francisco poster art featuring work by Stanley Mouse, David Singer, Dennis Larkins, Gary Houston and Chris Shaw will be held in conjunction with a major exhibit of Grateful Dead art in the Dr. Martin Luther King Jr. Library. Panels will explore the band’s influence in such diverse areas as politics, business, journalism, religious studies, and even gourmet cooking. Confirmed participants include Grateful Dead Vault Archivist and Legacy Manager David Lemieux; Rhino Records President Mark Pinkus; acoustician Elizabeth Cohen; technology investor and Moonalice founder Roger McNamee; journalists David Dodd, David Gans, Blair Jackson and Steve Silberman; musicologists Graeme Boone, Shaugn O’Donnell and Brian Felix; historians Michael Kramer and Peter Richardson; photographers Susana Millman, Jay Blakesberg, Ed Perlstein and Bob Minkin; and master chefs Kimball Jones, Kevin Weinberg and Ray Sewell. Family members of the band include Trixie Garcia, Rosie McGee, and Rhoney Stanley.